Commissioners of health of three north eastern states have declared a simultaneous end of Cholera outbreaks from their respective states. 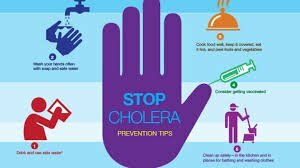 In a synchronized event, the Commissioners of Health in Borno, Adamawa and Yobe states recently said it has been over two weeks since the last cases of Cholera were detected in their states, according to a statement on Tuesday. This made them meet the epidemiological protocols and standards that when the number of suspected cases in an epidemic area significantly declines and all samples from suspected cholera cases test negative for a minimum period of two weeks, the outbreak is considered controlled. The last cases of cholera were reported in Borno State on December 14, 2018, while Adamawa and Yobe states reported their last cases on November 23 and December 24, 2018, respectively, indicating an end of the outbreaks according to epidemiological standards. Since the outbreaks of cholera were declared in each of the states at different times in 2018, close to 11,000 cases, including 175 deaths with a case fatality ratio of 2.1 per cent, were reported across the three states as of January 15, 2019.
WHO Emergency Manager for the North East Nigeria, Dr Collins Owili, explained that the outbreaks affected close to 11,000 people across 28 Local Government Areas (LGAs) with Borno contributing 58 per cent, Adamawa, 25 per cent and Yobe State 17 per cent. In an address to the media on the official closure of the outbreak in Maiduguri, Borno State, the Commissioner for Health, represented by the Permanent Secretary, Alhaji Bukar Mustapha Allau, commended WHO’s technical leadership and coordination of the health sector response.